Salinity is one of Australia’s biggest environmental problems. A build-up of salt in the soil, waterways and ground water is damaging Australia's landscape making it difficult for vegetation to survive and grow. How does salinity occur, and what can be done to stop it advancing further? 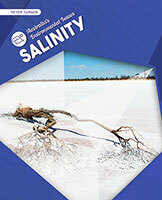 Salinity explores the problem of too much salt in Australia’s natural landscape, as well as explaining the steps that need to be taken to combat salinity.